This was my gift for the Summer 2016 swap. A marking knife from O1 steel, heat-treated in the shop. 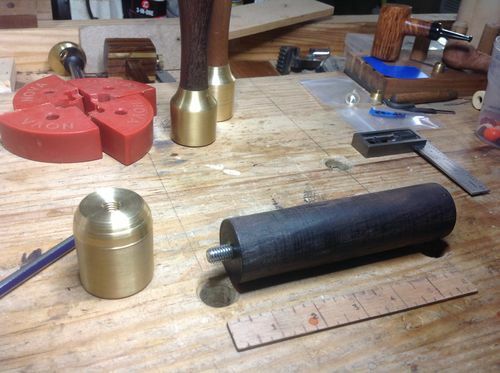 I also made the brass ferrule. Handle is African Blackwood, and shaped very thin. 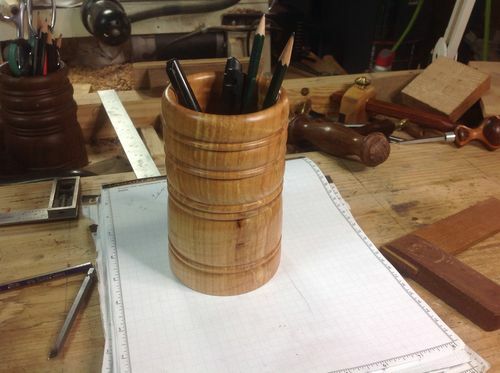 The Black Walnut pencil holder was very simple, but I hope it can be used anywhere; shop or office or kitchen? I added the brass mallet as a bonus gift. Shaped from 1 5/8” solid brass and attached to the Blackwood handle with threaded rod, just as Veritas does. Looks like your usual top notch stuff Terry. Very nice. Your work is always so stunning Terry. A beautiful, refined, and elegant looking set; luck recipient to be sure. Lovely set of useful tools Terry. Absolutely Magnificent! You are quite the artist with woodworking. Please keep posting as I certainly admire your lovely work. Awesome job, Terry. I like ‘em! Gorgeous set Terry. Gonna have to make me one of those pencil cups! Great set of tools for the swap, Terry. I am most impressed with the brass mallet. I think the blackwood and brass combination is stunning. Very nice. Did you in any way fasten the handle to the head other than screwing it in? nope, just screwed tight. Seems to work on the Veritas mallet I’ve had for a few years. Kenny, have made 2 more since then for some reason? Wanna trade for one of cherry or maple? These are very nice shop built tools. Congratulations. Nice combination of brass and wood. Just saw this one. Sorry but it’s the Walnut that really did it for me. This one’s lovely but I just seem to have a fetish for the rich, creamy brown of that figured Walnut you used for the swap. If ya’ make another one of those you wanna part with, just let me know what you want in exchange! I came. I saw. I liked!